Sales Manager and partner at Pacemaker Buildings. 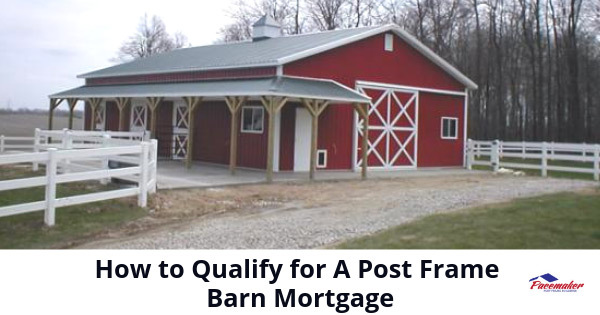 Qualifying for a mortgage for a post frame barn, equestrian center, or other agricultural building is not so different than for any other building. However, because the completed cost and operating expenses of a post frame barn are often less than with commercial or steel buildings, qualifying may be simpler. In fact, some lenders specialize in financing post frame or post-and-beam agricultural and commercial buildings and even post frame residences. With today’s techniques and materials, modern post frame structures can meet FNMA approval and fixed rate requirements if they are to be, even partially, designated as a residence. But future owners of post frame barns used strictly for agriculture can have an easier avenue today to secure full financing. The key is to shop around for a bank that specializes in this type of financing. Many banks across the country understand the value that a practical and long-lasting post frame barn brings to an active farming business. Check out your options before you proceed. Always a practical option for a homeowner with sufficient equity in their residence, a Home Equity Line of Credit (HELOC) may allow you to borrow the necessary amount to construct the post frame barn by using your home equity as security. Saving and paying cash is always an acceptable option for paying for a new post frame barn. You might tap your savings or sell some unneeded assets, and the benefit is that you will not have recurring payments. As a result, 100% of the building belongs to you or your business from the outset. Lower Cost. Cost-per-cubic-foot is often less than other construction methods due to efficient use of materials and labor, lower energy usage, shorter time to completion, and frequently less site preparation. Right-Sizing and Expandability. Post frame buildings can be built for present and near-future needs, keeping in mind that expansion is a simple process. 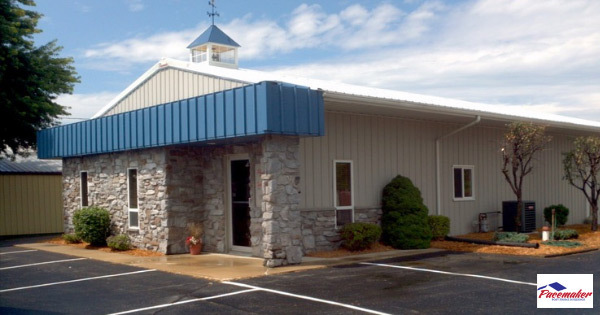 Because the vertical supports are widely spaced, adding to your original building is easier with post frame buildings. Lower Energy Costs. Due to the wide spacing of the vertical posts, the sides and ceilings of post beam buildings are more uniformly insulated. For questions about the design or recommendations regarding the financing of a new post frame barn, contact the experts at Pacemaker Post Frame Buildings. 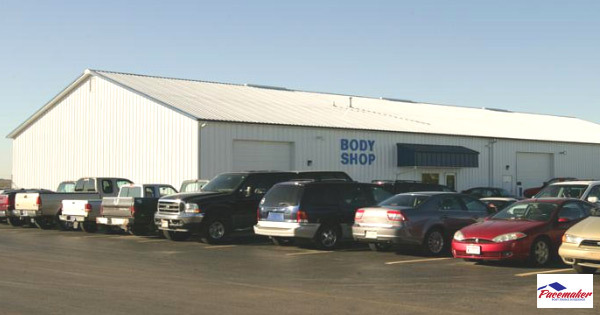 Located in Northern Indiana and serving Northern Indiana, Southwest Michigan, and Northwest Ohio. Pacemaker designs, manufactures, builds, and consults for post frame structures. For over four decades, the Pacemaker professionals have helped forward the technology and applications of modern, durable, and attractive post frame buildings. Visit the Pacemaker website to see examples of their many extraordinary projects. Or, phone the Pacemaker professionals with any questions at 888.834.4448. This entry was posted in Post Frame Buildings and tagged financing for post frame buildings, post frame building mortgage, post frame buildings on April 9, 2019 by Jack Cripe. Pole frame barns have been around for decades. 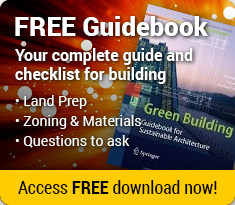 During that time, the materials and techniques have improved to transform this type of construction into a suitable option for more than only agricultural structures. Today, pole or post frame methods with so much unobstructed space within are perfect for warehouses, retail structures, municipal buildings, fire stations, churches, schools, and even residences. 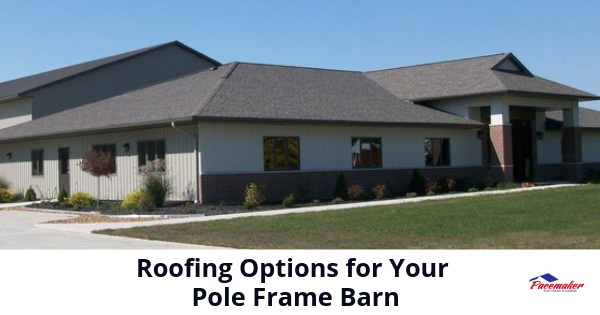 Selecting the best roofing style and material for your pole frame barn depends on factors that include weather, the durability of materials, and aesthetics. In heavy snow areas, you should select a roofing style and material that will allow the snow to slide easily off the roof to minimize excess load. Alternatively, you may want to match the barn roofing with the roofing style and material of the home or other surrounding buildings. Gambrel Roofs maximize the space above the trusses and offer additional headroom and storage on the upper floor. Although framing for gambrel roofing is a bit more complicated, the extra space and the traditional barn appearance can be worth the effort. Hip Roofs are not typical on barns, but many choose them to match their home architecture. Some cubic footage on the top floor is lost due to the slanted angles of all four sides and ends. Gable Roofs consist of two equally pitched sides and is probably the easiest to frame. This traditional A-shaped roof is excellent for shedding snow and provides reasonable storage space, less than gambrel roofs, but more than hip and shed roof systems. Ventilation is superior with gable roofing. 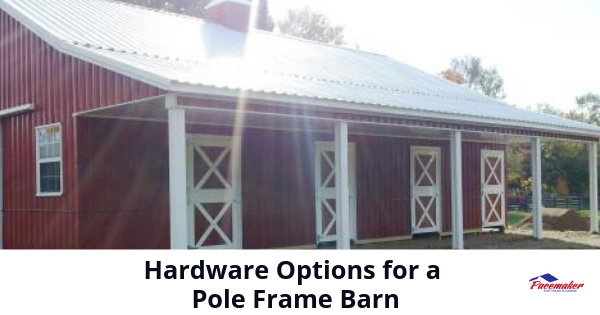 The appropriateness of roofing materials for pole frame barns depends upon the circumstances. If snow is a significant factor, metal roofing is preferred because of the material’s ability to allow snow and ice to slide off unrestricted to the ground. In addition, quality metal roofing will last up to three times longer than asphalt shingles under normal conditions. As well as possibly longer in extreme climates. Metal roofing is more environmentally sustainable. Often made from recycled metal and is itself recyclable, metal is energy efficient and reflects heat away in the summer months. The material is “leak-free” and can withstand high winds and severe conditions better than asphalt tiles. Although metal roofing is more expensive, the combination of long-lasting and energy efficient will offset the cost difference over time. Check with local zoning authorities before installation. Shingles, asphalt or other types, are less expensive to install than metal. Some pole frame barn owners choose to match their home or other neighborhood buildings by staying with shingles. Asphalt shingles come in a wide range of styles and colors. Many consider shingles to be more attractive and less “industrial” than metal roofing. When the time comes for replacement, you always have the choice to change to other more fitting colors. 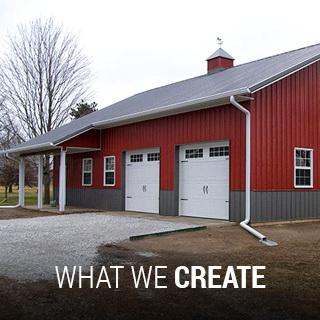 The longtime experts in post frame construction in Northern Indiana and the surrounding region, Pacemaker Post Frame Buildings understands the needs of pole frame barn owners. Whether the structure is for storing equipment, housing animals, or keeping grains and hay dry, Pacemaker can help with the design and construction. 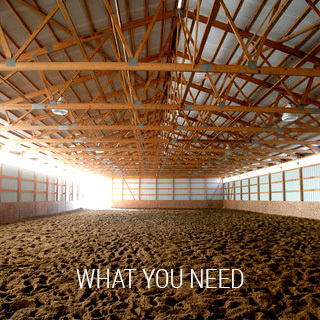 The company will supply all the parts and will advise the appropriate roof options for your barn. Visit the Pacemaker website to learn more about post or pole frame buildings, or phone 888.834.4448. This entry was posted in Pole Barns and tagged pole buildings, pole frame barns, pole frame building roofing options on March 26, 2019 by Jack Cripe. Pole frame or post frame buildings are descriptive terms for a framing and construction technique that provides durability and practicality for commercial, municipal, agricultural, residential, and retail construction. Pole or post frame building techniques first gained popularity as agricultural and equestrian buildings decades ago. While the method of construction has evolved with modern materials and techniques, the real advantages of post or pole frame building are readily apparent. Post frame buildings are easier to construct, require less labor and materials, provide more open space for maneuvering, and, by design, endure high winds and devastating storms better than many conventional structures. Pole frame buildings are extremely versatile. Depending on their intended use, the industry offers a full catalog of hardware options. A major decision for selecting the appropriate hardware will pertain to the type of pole frame exterior doorways to be installed. This decision depends on several variables, but the size of the opening is most important. Whether you will be entering and exiting with a truck or tractor or will need access for horses or other animals, the door opening must be substantial. In any case, the type of door and the appropriate hardware will be an important decision. Doors and hardware can be both functional and decorative. In areas where snow and ice are a seasonal threat, the larger doors may be overhead garage-type doors that will operate without having to clear away snow from the entrance. These may also be sliding doors although placing the tracks on the inside is preferable. In warmer climates, normal human-powered hinge doorways should work, although opening and closing large doors can be strenuous. Specialty door hardware for pole frame structures is available is many types and styles. Hardware can add to the appearance of the structure while providing practical advantages. The tracks and other materials for the hardware should be made from heavy gauge steel. Therefore to withstand severe conditions and massive loads. Frequency: More robust hinges and hardware are important to survive frequent daily opening and closing. Frame or Door Jamb Construction: Ensure that the material and construction of the door jamb are capable of withstanding heavyweights and stress levels. Door Size and Weight: Heavier doors require heavy-duty hinge construction. For swinging doors, hinges are made from higher grade steel than for standard doors to withstand heavier loads. The finish for the hardware should be treated also to prevent deterioration in harsh weather conditions. Manual or automatic doors need strap-type door hinges engineered to handle weights up to 5,000 pounds. Furthermore, if properly mounted to substantial metal or wood door jambs can handle even higher weights. Additionally, opening and closing doors frequently require sturdy hardware. For more information regarding the use and installation of the appropriate doors and hardware for your pole frame barn or equestrian center, contact the professionals at Pacemaker Post Frame Buildings. With over four decades of experience designing and perfecting post frame buildings, the experts understand the issues and advantages surrounding this affordable and durable construction. 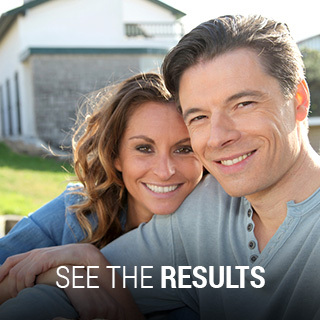 Visit the Pacemaker website or call 888.834.4448 to find answers to any questions. This entry was posted in Pole Barns and tagged doors for post frame buildings, pole barns, post frame barn on March 12, 2019 by Jack Cripe.